Location of Citrus County, Florida. My late grandparents used to live in Inverness located on the eastern side of the county. The Sabertooth Cave fossil site is located near the center of the county. My late grandparents lived in Citrus County, Florida for about 5 years during the mid-1970’s. A manmade freshwater canal flowed past the property line of their backyard. Developers probably dug the canal to connect residential properties with a large natural lake. If a resident felt like boating on the lake, they had direct access to the water. I recall enjoying many adventures when our family visited Inverness. I caught chain pickerel and bullhead catfish in the canal. I remember being so thrilled that I jumped up and down after landing the pickerel. For a 10 year old with a self-esteem not unlike that of the comic strip character, Charlie Brown, successfully catching a fish was a big deal. One day, my father and I paddled a canoe to an island in the middle of the canal. We disembarked to do some exploring, and I almost stepped on an alligator’s head. It hissed at me and retreated into the water. On another occasion my grandfather took the whole family in his big new boat, and it started taking on water. My mom nervously urged him to turn the boat around. On my own I explored old grapefruit orchards, and the huge natural lake nearby. I saw lots of wildlife including ospreys, limpkins, coots, anhingas, a large soft-shelled turtle, and a Florida muskrat which scolded me as I walked along the edge of the canal. This area of Florida has always been a great place for a boy’s adventure. In 1928 a group of boys found a natural trap cave not far from Lecanto, a town located in the center of the county. They explored it, and 1 of the boys found a complete upper left canine of a Smilodon fatalis. The cave was given the name Sabertooth Cave based on that specimen. Photo of Sabertooth Cave. I wonder how the boys explored it. They must have used a ladder because the shaft is vertical. The cave is actually a sinkhole trap created when acidic rainwater dissolved underlying limestone causing the ground to collapse underneath. Animals sporadically fell inside and some birds nested in the sheltered trap, accounting for the fossil accumulation. By 1928 the cave was accessible to the surface through 2 vertical shafts ranging from 25-40 feet deep. 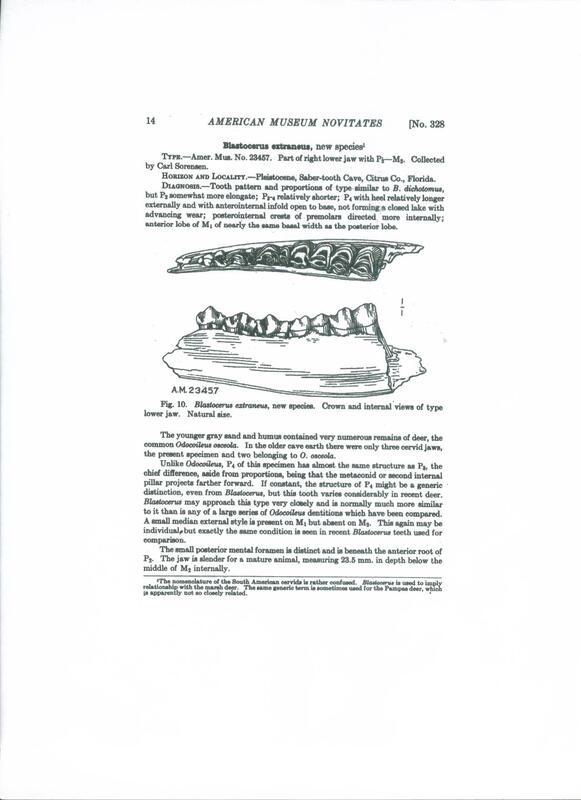 George Simpson excavated the fossils that same year and catalogued them in the below referenced paper. I’m researching for a future essay about Pleistocene deer, so I was interested in 1 particular specimen excavated from this site. The only fossil of a species closely related to the South American marsh deer (Blastocerus dichotomous) was found here. Based on a lower jaw, Simpson declared it was a new species–Blastocerus extraneous. However, in his book Fossil Vertebrates of Florida, Dr. Richard Hulbert expressed doubt that it was a valid species because no more marsh deer bones in North America had been discovered since. I compared the illustration of the supposed marsh deer jaw bone with 1 from a photo of a white tail deer jaw bone I found on google images. They look like an exact match. I inquired about this species on The Fossil Forum website, and an anonymous expert informed me that Simpson didn’t have access to Key deer material for comparison. The anonymous poster claimed that he did collect road-killed Key deer material for paleontological comparisons, and that the specimen from Sabertooth Cave was from that small subspecies of white-tail deer, not a marsh deer. Apparently, there was a great divergence in size within the local population of white-tails as early 130,000 years ago. During this time period marine highstands flooded the keys, and surviving Key deer must have mixed with the general population of deer. The problem with this explanation of the specimen is that marsh deer are slightly larger than white tail deer, not smaller. Though it would be interesting if South American marsh deer once lived in Florida, I’ve concluded that Simpson was wrong, and the jawbone is just from a regular old white-tail deer. Judge for yourself from the following images. An illustration of the jawbone that I believe George Simpson misidentified as coming from a species closely related to the South American marsh deer. I just don’t see what he was seeing. Click to enlarge. Jawbone from a white tail deer. Looks like a match with Simpson’s illustration. The specimen Simpson mistakenly thought was from a South American marsh deer, possibly may be from a Key deer, a small subspecies of white tail deer that mixed in with the general population during marine highstands when small areas of land across the state became isolated from flooding. Though the small subspecies often became genetically swamped, the genes for dwarfism remained in the population, allowing the subspecies to become re-established on keys . Although I think the marsh deer specimen was a bust, Sabertooth Cave produced many exciting fossils typical of the late Pleistocene–Wheatley’s (or Jefferson’s) ground sloth, giant armadillos (pampatheres), mastodon, llama, long-nosed peccary, white tail deer, horse, tapir, capybara, saber-tooth cat, and dire wolf were the large mammal species found. The smaller mammal species included opposum, beautiful armadillo, mole, marsh rabbit, cottontail rabbit, cotton rat, rice rat, Florida muskrat, gray fox, bobcat, and striped skunk. Sabertooth Cave is the type locality where fossils of the Florida bog lemming (Synaptomys australis) were first found. The Florida bog lemming may simply be a large extinct subspecies of the southern bog lemming (Synaptomys cooperi). Scientists aren’t sure. On islands large ungulates become dwarfs, while some rodents grow larger. It’s possible during marine highstands there were many isolated islands within vast wetlands. That would account for key deer and large lemmings in a site located so far inland. Another interesting find at this site was the apparent co-existence of the western species of pocket gopher (Thomomys sp.) with the eastern species (Geomys pinestis). A western species of pocket gopher from the Thomomys genus. It lived in Florida during the Pleistocene. Southeastern pocket gopher. I think my cat killed 1 of these once but she wouldn’t let me take a close look at it. Bird fossils unearthed at Sabertooth Cave were diagnosed as being those of a lesser scaup aka bluebill duck, turkey vulture, black vulture, bald eagle, sparrow hawk, barred owl, barn owl, screech owl, bobwhite quail, and turkey. Some of these birds may have roosted here and dropped prey in the cave. I think the vultures and eagle were attracted to animals that fell in the cave and died, and the scavenging birds in turn became trapped. Somehow alligators and turtles fell inside the cave as well. The species composition shows that the surrounding landscape consisted of freshwater marsh, woodland swamp, and some meadows–similar, if not exactly, the same environment that existed here til the 20th century when man ruined it. As far as I know, scientist haven’t attempted to date the fossils found here, but most suspect they date to the Sangamonian Interglacial ~132,000-~118,000 BP. Sabertooth canine from whence this nice fossil site got its name. This entry was posted on February 28, 2013 at 1:07 pm and is filed under Fossil Sites, Uncategorized. You can follow any responses to this entry through the RSS 2.0 feed. You can leave a response, or trackback from your own site.